There is more information available on this subject at United Nations on the English Wikipedia. The United Nations (UN) is an international Earth-based organization, and the predecessor of the UNSC and the Unified Earth Government. 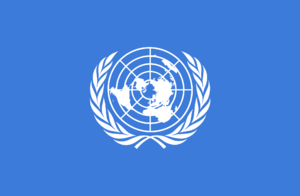 By the 26th century, the UN has been absorbed into a branch of the UEG and has become a largely vestigial entity, acting as a local administrative body among the national governments of Earth. The idea of a United Nations system of global governance began in 1920 after the end of World War I. The brainchild of American President Woodrow Wilson, the purpose of the League of Nations was to spark economic development and to keep the peace after the destruction of the war. However, this organization would soon collapse without the support of the United States Congress and growing tensions caused by the Great Depression of the early 1930s. Its ultimate downfall came with World War II which the League was completely unable to prevent. The concept, however, had not been discredited. In 1941, US President Franklin D. Roosevelt named the Allies the "United Nations" with the name being kept after the Second World War's end as a peacekeeping organization comprised of the members of the military alliance. This was a significant time in human history as it sparked growing tensions between the two superpowers of the time, the United States of America and the Union of Soviet Socialist Republics which would lead to the space race and the development of many advanced technologies as part of a technological arms race. Had humanity not endured the Cold War, it is likely that humanity would have been even less prepared for the interstellar age and the inevitable wars that would follow. The UN began as an international organization that described itself as a "global association of governments facilitating co-operation in international law, international security, economic development, and social equity." It was founded officially on June 26, 1945 after the end of the Second World War at the signing of the United Nations Charter by 51 countries, replacing the previous "League of Nations." By the time humanity began colonizing the other planets of the Sol System in the late 21st century, the nations of Earth were not yet united under a single government, though the United Nations held considerable power over humanity. In order to tackle the social, economic and technological challenges that accompanied space colonization, the UN created the Unified Earth Government in 2075. Then a transnational assembly of brilliant minds and political figures, the UEG initially lacked actual power over Earth's nations. In the early years of humanity's interplanetary colonization, it was mainly commercial interests that propelled outward expansion into the Sol System, the colonization programs initiated by Earth's national governments themselves being far less ambitious and efficient. Free of the restrictions of international law, many corporations operating in the colonies—particularly those on Mars—conducted extensive research and development into bio- and nanotechnologies. While these efforts yielded many new technological advancements, abuses by the corporations also generated major ethical concerns. To regulate the activities of the off-world corporate entities—particularly in the area of genetic technology—the UN extended the UN Genetic Rights Act to cover the colonies in 2165. This piece of legislation would later serve as the basis for the latter Mortal Dictata Act. The UN's attempts to maintain peace ultimately failed as various dissident factions arose in the colonies, resulting in several conflicts in the 2160s. These battles across Sol's off-world colonies culminated in the Interplanetary War of 2164 - 2170. With an approach echoing the policies of the United States in the early 21st century, the United Nations took charge of Earth's national governments as well as their disparate military forces, uniting them under the common banner of the United Nations Space Command in 2163. Following the war in 2170, the United Nations formally established the Unified Earth Government as humanity's combined governing entity from then on while the UNSC became a preeminent military body for Earth's "empire". By the 26th century, the UN had become greatly diminished from its height in the mid-22nd century. Its function was relegated to overseeing administrative tasks on Earth, essentially a role similar to that for which it was originally created, with supreme power over the human race at large at the hands of the UEG. After the beginning of the Human-Covenant War, the UNSC gained ultimate control of the UEG and its branches, including the UN, as humanity's emergency military government. The UNSC returned power back to the civilian government on January 8, 2553. ↑ 4.0 4.1 Halo Waypoint: Query Answer: Human records indicate that the assembly (ref: United Nations) is a vestigial organization responsible for adjudication of administrative tasks between territorial sectors on Erde-Tyrene.